Our adult ministry exists to provide avenues for each of us to intentionally grow in our relationship with Christ through prayer, studying His word, fellowship and service. We offer these opportunities through a variety of adult Sunday School classes, Ladies and Men's specific Bible Studies that meet at various times over the year, Men's Breakfast fellowship and more. Check out our Newsletter on the home screen or events page for the most current listing of these events. At FBC we also offer Life Groups; small groups who gather to share life together, grow in faith, pray for each other, hold each other accountable and become stronger disciples for Christ in a smaller group setting. 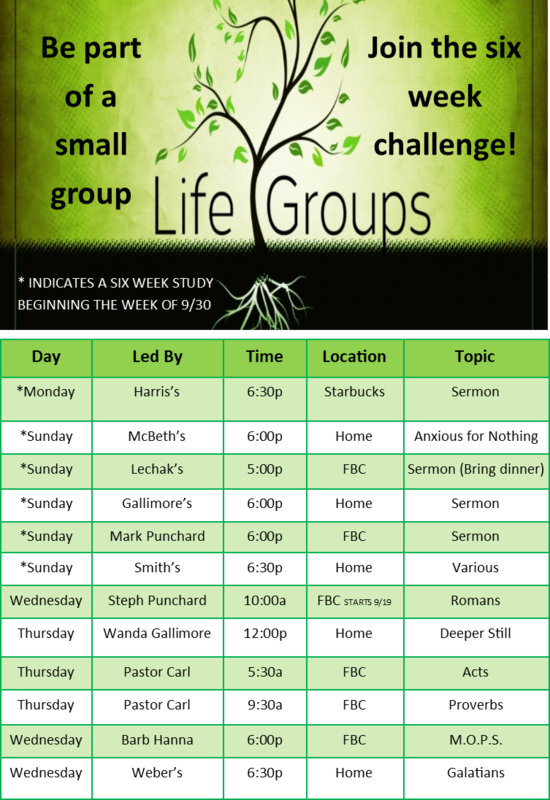 We have several Life Groups that meet throughout the year.